Your Finance Formulas: What Are The Impacts Of Having A Bad Credit History? Let’s Find Out! What Are The Impacts Of Having A Bad Credit History? Let’s Find Out! We all reach the age of 18 with a neutral credit score - not good, not bad, but neutral. Once we become a fully fledged adult, we then have the ability to change our credit score. Some behaviors take our credit scores up, while others take them down. Something as small as one direct debit payment bouncing can have an impact on your credit score. Or, not being on the electoral role, for instance, can also negatively impact your score. However, it tends to be things like late payments on loans or credit cards that have the biggest impact on our credit scores. Leaving us with a bad credit history. For many of us, having a bad credit history is something that’s somewhat confusing, as we’re not 100 percent sure what it actually means. As well as what the impact of it is on our lives. However, it’s crucial that you understand what having a bad credit history means. Your credit score, whatever it may be, will impact your ability to get a loan approved. If you’ve got a low score, this means that often, loan providers won’t be able to offer you a loan. This is because a low credit score reflects the fact that you’ve had issues paying things in the past. It also means that you’re too risky to lend money to because you may fail to pay it back. There are, of course, a few providers who will be able to offer you bad credit cash loans, but mainstream lenders and the bank probably won’t be able to. 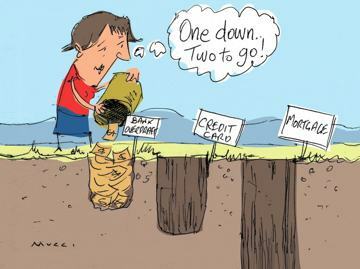 Bad credit will also impact your ability to get a mortgage, which may mean you’re unable to buy a house of your own. There’s also the fact that if you do get approved for a mainstream or bank loan, the interest may be higher than normal. Of course, if you need the loan, you need the loan. It’s just a case of understanding that because of your bad credit history, you may end up paying more for it. This means that instead of paying 20 percent interest on the loan, you may have to pay around 40 percent. When you rent a property, before the landlord will allow you to live in their house, they may want to run a credit check. This is to check that you’re reliable when it comes to payments and won’t end up unable to afford your rent. If a credit check shows that you’ve got bad credit, they may refuse to rent their property to you. If this is the case, sometimes having a guarantor in place can help. This should be someone who has a high credit score and earns a good amount, who can pay your rent should you not be able to. The same situation can apply to attempting to get a phone contract, TV package, internet package, or home or car insurance premium. The fact is, having bad credit can impact your life in a range of ways that you would never imagine it would.